Stressed, overwhelmed, in need of a relaxing getaway? Canadians are a busy bunch! With all of life’s obligations, we’re pressed for leisure time. Cruises provide an effortless way to unwind, spend quality time with family and friends and see some sights, surrounded by all the creature comforts. However, cruise itineraries can be complex. Before you board the ship, you may have to negotiate connecting flights, and once you’re on board, you’ll be stopping in various ports. Connections can increase the chances of a disrupted or interrupted trip, and travelling in such tight quarters, can up your chances of getting sick. But with comprehensive insurance for cruise travel to help cover any potential losses, and a few smart preventative measures, you’ll be all set to sail! You might be asking yourself if cruise insurance is worth it. Find the answer to that and learn all about cruise insurance, below. Plus, arm yourself with a few tips for protecting yourself and your loved ones from sickness and injury. Having travel insurance coverage allows you to relax and enjoy your vacation knowing your bank account won’t take a hit if you or a family member gets sick or injured, or you miss a connection along the way. Planning a cruise? Before you set sail, make sure to get insurance for cruise travel. If you’re planning a cruise, you might be wondering what kind of travel insurance is best and how to get the most comprehensive cruise insurance coverage possible. Emergency Medical Insurance, Trip Cancellation & Trip Interruption Insurance, or an All Inclusive policy are great options! Cruise ships have resident doctors to treat minor medical issues. For emergencies, you’ll be disembarked and treated at an appropriate medical facility on land. However, your provincial health care won’t cover most of the costs—Emergency Medical Insurance may. In fact, despite the name, Emergency Medical Insurance covers more than just medical care. In addition to hospital and doctors’ fees, prescriptions and medical supplies like crutches and emergency transportation, it can cover out of pocket expenses (if your travelling companion is hospitalized) and even the cost of childcare. If you’re travelling with family, you’ll want to consider an Emergency Medical Family Plan. This economical option protects the whole family in one convenient plan, whether you’re travelling together or separately. Families get ready to set sail for a cruise to Alaska. According to our travel insurance policy, a family includes individuals 59 years of age and under consisting of you, all dependent children, dependent grandchildren, and your spouse. When you’ve put precious time, energy and money into planning your vacation, the last thing you’re thinking about is cancelling. But when the unexpected happens, travel insurance can cover you! If you have to cancel your trip before you’re scheduled to leave, or your trip is interrupted while you’re on vacation, then a Trip Cancellation & Trip Interruption policy can help ease the sting. It can cover non-refundable costs like airfares, hotels, or your cruise. If you’re only taking one big trip a year, than a single trip policy is a great option, but if you’ll be doing multiple trips, a Multi Trip Annual policy might be more suitable. If you’re under 59 and looking for even more comprehensive coverage, consider an All Inclusive Holiday Package. It includes Emergency Medical Insurance, as well as Trip Cancellation & Trip Interruption, Accidental Death and Dismemberment and Baggage Insurance. Can I get cruise insurance if I’m over 65? Many travel insurance providers cover individuals up to age 89. Whereas, TuGo insures travellers regardless of age, provided they’re not travelling against a doctor’s advice and they haven’t been diagnosed with a terminal condition. 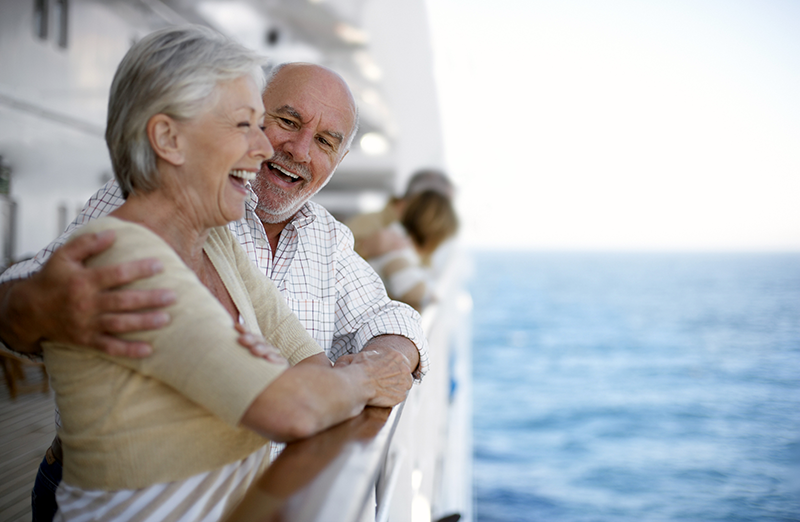 Seniors will be able to relax and enjoy, knowing they’re covered by travel insurance. Seniors enjoy the view from the deck of their cruise ship. If you’re over 60, you’ve likely filled out a Medical Health Questionnaire (MHQ). TuGo’s simple Traveller MHQ determines rate – not eligibility, and has an extra layer of protection: the deductible. Unlike other travel insurance providers, if you make a mistake on your MHQ, TuGo won’t automatically void your insurance. Instead we’ll apply a 15,000 USD deductible to reimburse you for the rest of your claim cost, subject to the policy’s terms and conditions. Learn more about TuGo’s Traveller MHQ. What if I get sick in the middle of the ocean? Cruising is a safe way to travel, but due to its confined nature, getting sick or injured on a cruise is a common concern. Comprehensive travel insurance coverage won’t leave you stranded. In fact, if needed, your insurance provider should arrange for you to be air evacuated to a proper medical facility. Travelling with a friend? If you’re returned to your original departure point, your provider should arrange to fly him or her home too! If you want to continue your trip after being returned home for treatment, you could also be covered for a one-way return airfare to continue your trip as originally booked. What if I miss the ship because of a missed flight? 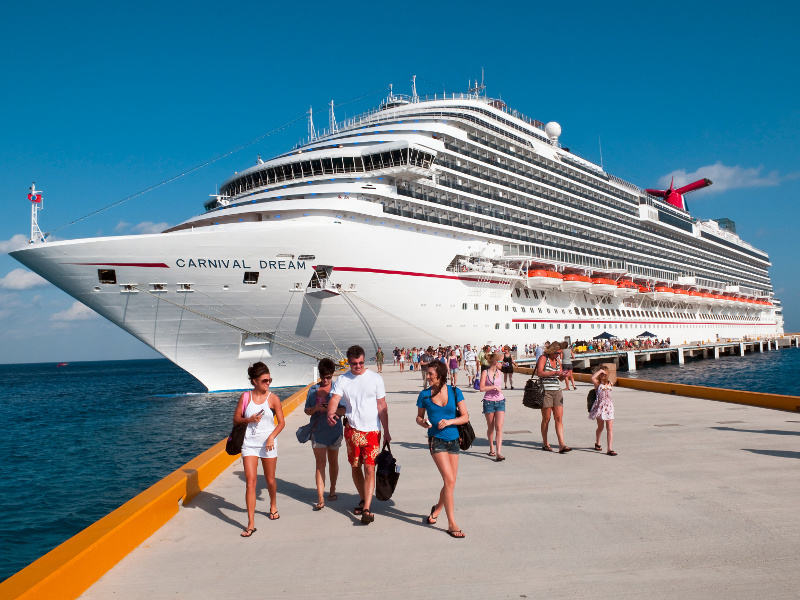 Many Canadians board cruises that start off in the US, making Trip Cancellation & Trip Interruption Insurance crucial. If you miss your ship due to a delay or schedule change of your flight, you could be reimbursed for your flight, a one-way economy airfare, transportation costs to catch up with a tour, or a one-way economy airfare to your next destination. Cruises offer the opportunity to unwind, but they also increase the chances of getting sick. With a few preventative measures, you’ll be all set to sail! Now that we’ve explained your travel insurance options, let’s talk about a few preventative measures to help you avoid getting sick in the first place. 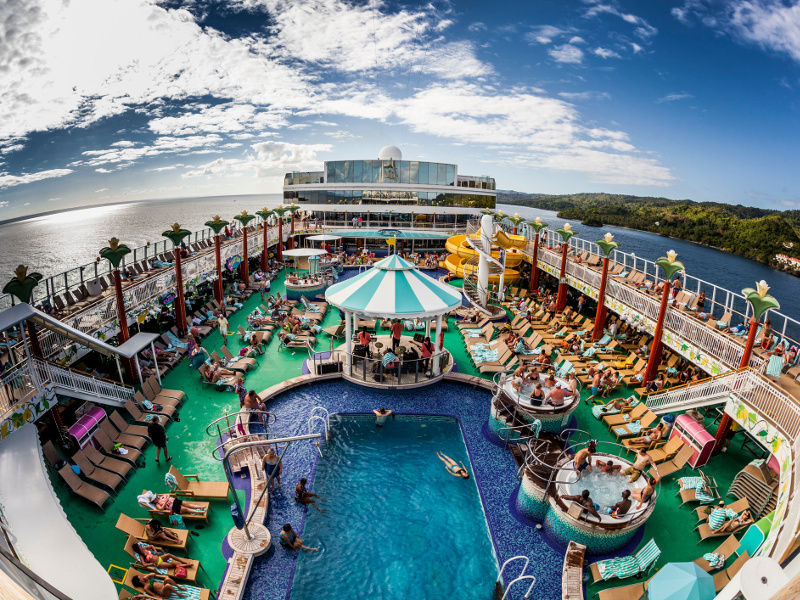 Tummy troubles are a common complaint on a cruise. Whether it’s seasickness or a stomach bug that causes vomiting or diarrhea, you’ll want to be prepared. Here are a few more tips for combatting travel food poisoning and travellers’ diarrhea. Unfortunately, respiratory diseases are also common on cruise ships. And succumbing to one can put a major damper on your vacation. Here are a few things you can do to help prevent them or at least hold them at bay. To boost your immune system! Although you’re on vacation and will want to indulge, maintaining a healthy lifestyle will help you feel better all around and boost your immune system too. References: Centers for Disease Control Prevention, Staying Healthy on a Cruise and Cruise Critic, How to Not Get Sick on a Cruise: 10 Tips. 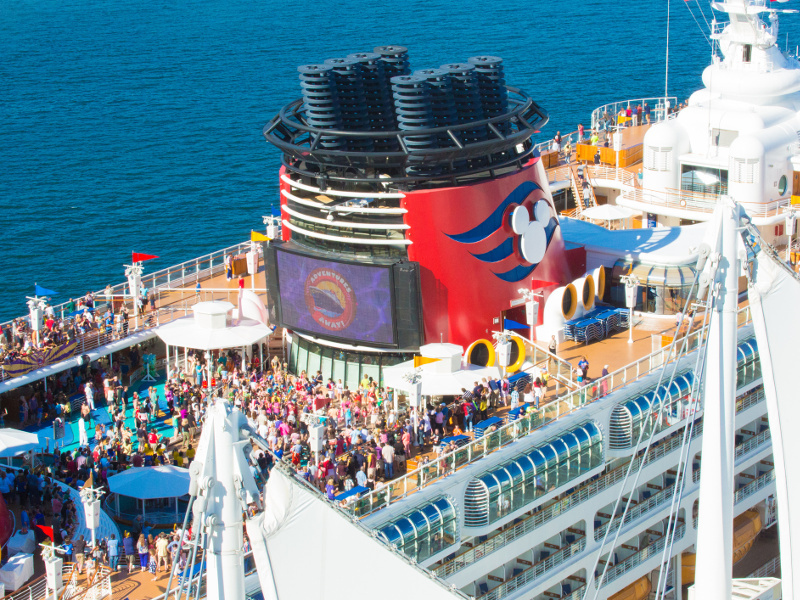 For cruise packing tips, check out Alaska Cruises- Set Sail for Family Fun. Now you’re all set to sail! Have cruise health tips of your own? Share below! We’d be glad to help. Here are some articles we think will be very useful for you. Travel Medical Insurance-What Does Your Plan Cover? If you have any questions, feel free to call Customer Service’s toll-free line at 1-800-663-5389.